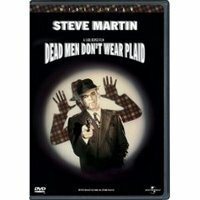 Just caught a movie tonight on cable called Dead Men Don't Wear Plaid. It's a film from 1982 starring Steve Martin and Rachel Ward in a film noir spoof. It's in black and white, and makes use of a clever idea to edit in actual footage from 1940's and '50's films. The plot isn't much to speak of...Martin plays a detective hired by a mysterious beautiful woman to solve a mystery. It propels the story along, but you're not watching for the plot. The movie has some great comedic moments as they parody all the usual film noir cliches. This isn't really a slapstick spoof of well known flicks like the 'Hot Shots' movies. There are some funny sight gags, but for the most part they play it kind of straight working off great deadpan dialogue and innuendo for the laughs. The best parts of the movie though, are when they seamlessly edit Martin into clips from great films of old. Thanks to clips from the actual movies, all kinds of classic stars show up through the film - Alan Ladd, Victoria Lake, Burt Lancaster, Barbara Stanwyck, Kirk Douglas, Ingrid Bergman and more. Of course, you couldn't have a movie like this without the man himself - Humphrey Bogart - showing up as Marlowe to help Steve Martin's Detective. I've got to hand it to whoever did the editing work on this movie. The inserted clips and dialogue are absolutely seamless and work remarkably well. Having the whole movie in black and white helps, I'm sure, but it's still a fantastic editing feat, not to mention this is from 1982. Comments on "Me Mini Movie Reviews: Dead Men Don't Wear Plaid"